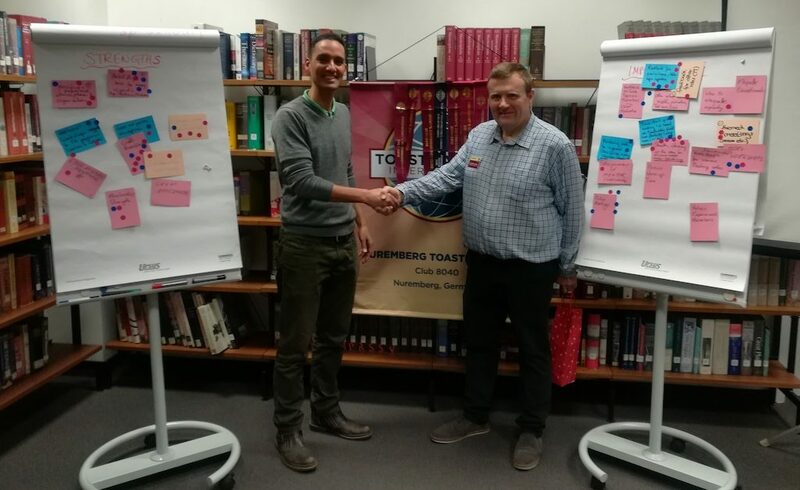 It was another excellent meeting at Nuremberg Toastmasters on Monday night. What’s more, it was a slight departure from a standard meeting. If you weren’t there, the meeting started off with club regular, Norman, giving a talk entitled: Is an electric car really a “green” choice. This was his fourth speech from the Persuasive Influence path. This speech’s aims are improving researching and presenting skills. Norman gave a very detailed, yet also concise presentation, comparing the overall level of CO2 emissions which both electric and regular cars produce over their lifetimes. I was quite surprised, as I thought that electric vehicles would be the clear winner. Unfortunately, the situation is somewhat more nuanced. 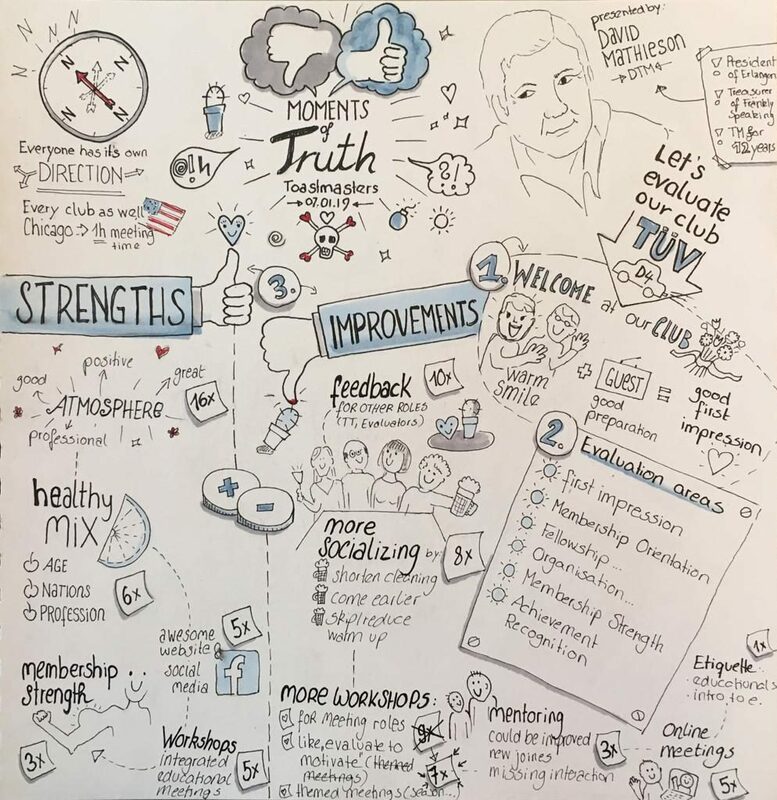 Moments of Truth Sketchnote, courtesy of Frauke Seitz. 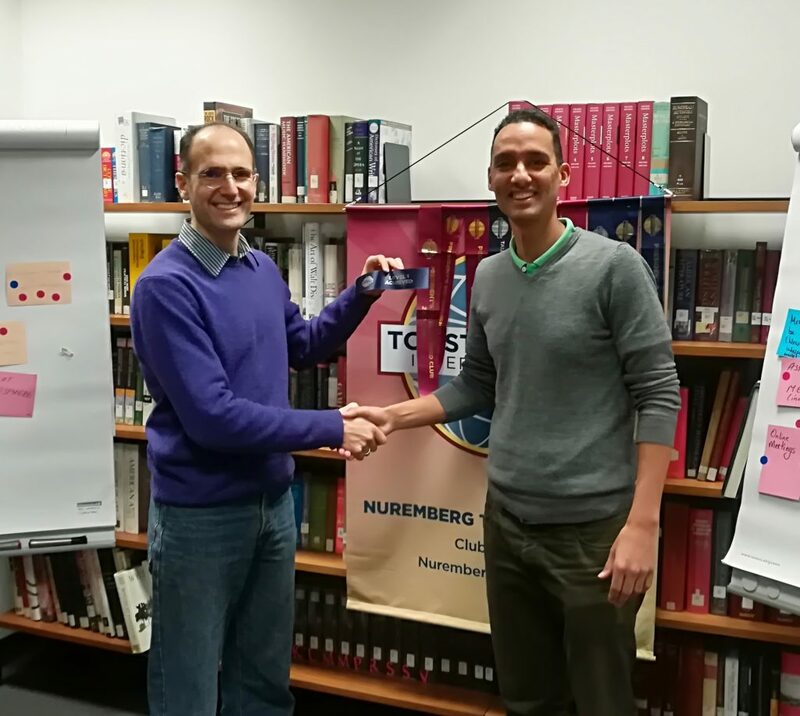 After Norman’s talk, we had the first ever “Moments of Truth” session at the club, facilitated by the wonderful David Mathieson (DTM). 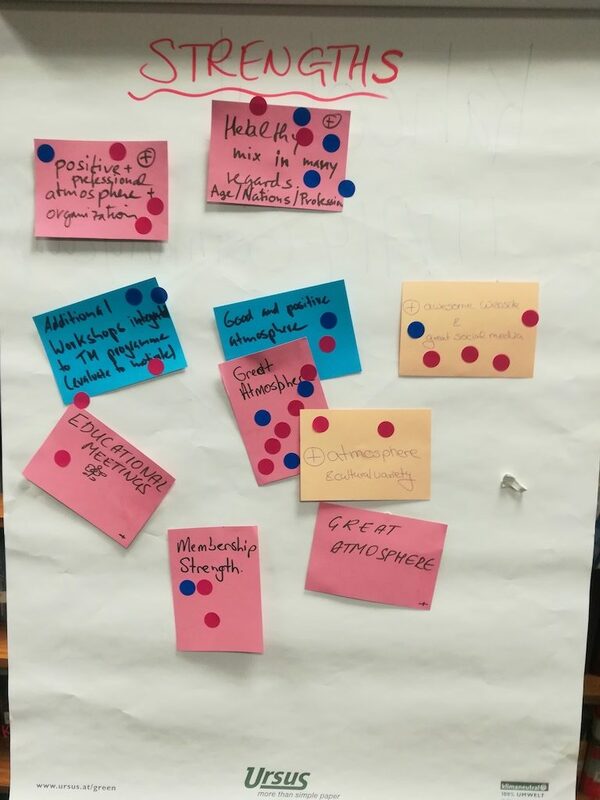 The session, which was the slight departure from the regularly scheduled program, allowed the members and guests present to break up into small groups and have a coordinated series of discussions around where the club’s doing well, along with where it can improve. As you can imagine, in sessions such as these there is always a flurry of ideas and suggestions. And it’s often hard to narrow all of them down to just the most important ones. But we all did well, and as it turned out, we all shared a lot of the same ideas. The thing that everyone feels the club does best is that it has a great atmosphere. 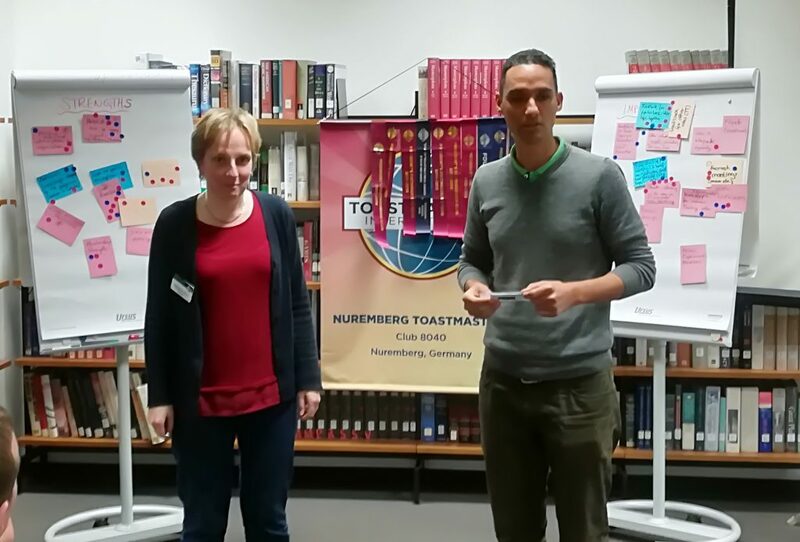 Where the club can improve, it was clear that we believe that there should be feedback for the table topics and for the evaluators. 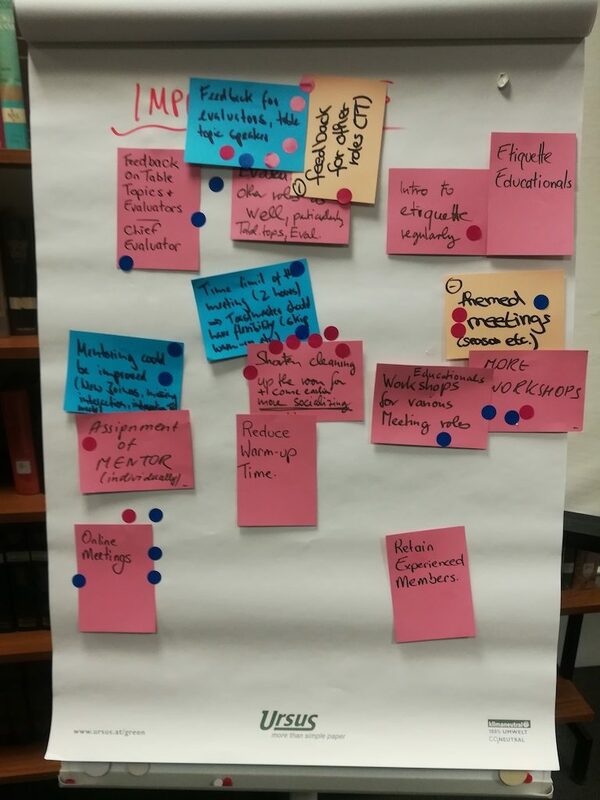 You can see the full list of ideas in the images below. Hiram and David Mathieson (DTM). There were two awards given out at the meeting. The first was to Norman, who received the Pathways Level 1. Persuasive Influence – 4 – Researching and Presenting. The second was to Claudia, who was awarded her ALB (Advanced Leadership Bronze) badge. Congratulations, Norman and Claudia. These awards are well deserved! Unfortunately, sometimes we have to say goodbye, even if only temporarily, to club members. And so it was at the meeting, that we said farewell to Norman, who’s moving with his family to Toronto, Canada. Norman, all the best in your new adventures. We wish you well, and you’re more than welcome to join us anytime you’re in Nuremberg. It’s been a pleasure getting to know you. This entry was posted in Club Meetings and tagged Claudia, meetings, moments of truth, Norman. Bookmark the permalink.